Seda Sayan drew significant and rightfully widespread anger by hosting Sefer Çalınak, who murdered his two spouses, on her TV show and by presenting and advertising him as a killer with a smile. However, we should approach this not as an individual issue but as part of the social hysteria that we live in. To treat the events as a case of calculated social hysteria that worships power and authority and that believes whoever holds power will provide us with clues about the bigger picture. 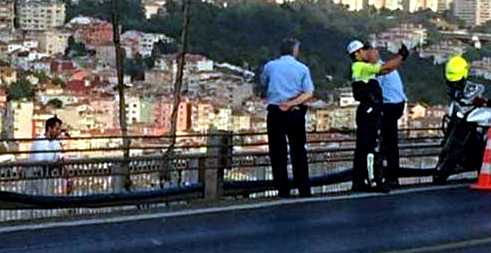 Indeed, the case of the police officer who took selfies while a civilian was attempting suicide on the Bosphorus bridge on September 1st2 is directly related to the Seda Sayan phenomenon. Both [incidents] involve actors who are inured to death and who try to find fame and reputation even in an atmosphere of death. To try to get higher ratings while normalizing women’s murders by men is quite equivalent to the situation of the police officer who tried to increase his popularity by advertising to the world that he was witnessing a suicide.